What better way to begin and end a day than with this view?! I recently created this simple wall hanging for our dining room and it has quickly become the kids' favourite place in the house. Over every meal we chat about the memories it holds, and I often find my children and their friends gazing up at the photographs, giggling softly and pointing out their favourite pictures. 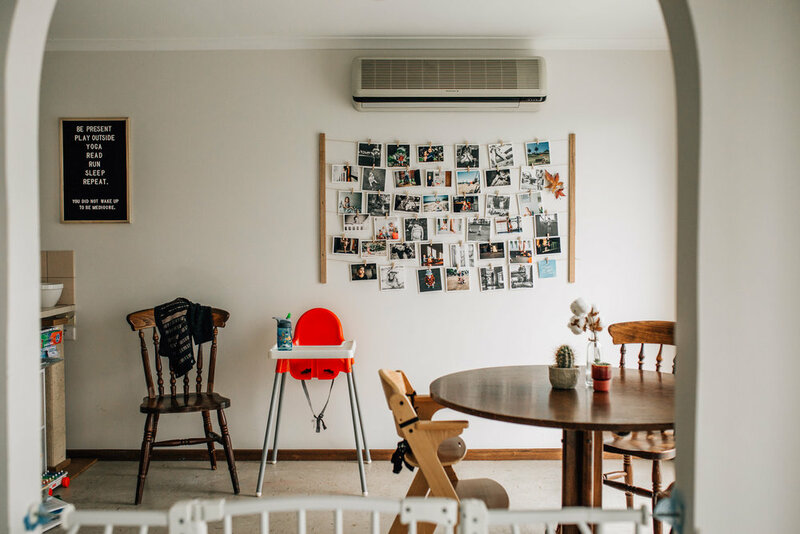 A simple wall gallery like this is a cost effective way to enjoy all those photos you may not necessarily choose to make into serious wall art. After all, each piece is small, interchangeable and relatively cheap. Also, when printed with the right lab, the paper or card on which your photographs are displayed will be thick and strong and wont curl with time or the weather. The majority of the prints pictured were actually printed through a consumer lab called Parabo Press. They're an online lab, and their quality is good, reliable, and SUPER affordable (oh, and with the referral code TXNEPW you can get $10 OFF your first order!). So. Need an instant pick-me-up that will last all winter? Make yourself one of these babies over the weekend! 1. Pop down to Bunnings and select a 1.8m length of Tasmanian Oak (30mmx12mm). It will cost you less than $6.00. Stroll on over to the cutting zone and ask them to cut it in half. Now you have two 900mm lengths. 2. Back at home, mark and then drill small holes down the narrow side of each piece of timber. Make your first hole at 3omm, then make four more holes, each 140mm down from the last so when you finish you have five small holes. 3. Decide where you want to hang your photographs. To hang your lengths of timber, I find it easiest to measure the centre point of the wall or space you've selected, then measure 750mm in either direction. Take care when hanging that your pieces are perpendicular to the wall / floor AND the same height from the ceiling / floor. 4. Take four sets of the large sized 3m strips and attach two sets to the back of each timber length; one toward the bottom and the other toward the top. Place on the wall in line with your measurements and apply pressure (note - two sets of large is recommended here not for weight but for tension - when the string is added, there will be a degree of pull inward as you make it taut. 5. Take a ball of twine or natural toned thick string (I used hemp string) and use a sewing needle to thread it through from the outside of the top most hole on one side, across the gap and into the opposite hole. There is no need to tie off between each length - simply continue, by threading your twine through the neighbouring hole, then across to its fellow on the opposite timber length. Continue until you reach the bottom hole. 6. After threading through the final hole, tie off. Then gently but firmly work upwards, removing any slack from your twine by pulling tightly through each hole as you move up the length of timber. When you reach the final hole (the first one you threaded), cut and tie off. 7. Find some adorable tiny pegs at any craft store and get busy decorating your picture gallery. You can add other bits and pieces, too - found objects, inspiring quotes, and little artworks. It's your happy space and there are zero rules!